1. You get endless FREE daylight! Solatube is a natural daylighting system that provides you with natural sunlight to a dark room in your home. The sun shines through the dome that is situated on your rooftop and the light moves through the tube, leaving the brightest light inside your home. Concerned about rainy days? Don’t be! You will still get plenty of light through your tube on rainy, cloudy days. The Spectralight Infinity tubing comes in separate sections that fit together like a puzzle. These pieces can bend and turn to fit any angle. This allows for Solatube to reach any dark room you may have even if they are floors apart. Regardless of the number of turns and angles, the innovative reflective tubing will not refract any light coming into your home. These nifty little tubes have a very low-profile dome that sits right on top of your roof. If you’re worried about the way they will look from the road, the tubes can be place on the backside of your roof and still reach any of your dark rooms. How cool is that? What you see is what you get. You do not have to plug in these tubes to receive the free sunlight. Yes, we do have to cut a hole, but I promise we’ll fill it in! The caps and roof accessories used in combination with the dome and seals, provide a virtually leak-proof system. We also provide a lifetime leak-proof guarantee and in our 8+ years of service, have never experienced any leaks with these systems. There are several fixture options available when purchasing your Solatube. These fixtures are interchangeable and can be changed out after installation. Because the tubing is made up of several separate pieces, we can extend these tubes to just about anywhere in your home. They can go from the back of your home to the front, or even from the third floor to the first! 8. They work … even at night! This great daylighting system is also a great night-lighting system! Our Solatubes include an integrated solar nightlight that gives off soft-glow night light. There are dimmer switches available so that you aren’t indebted to constant light in your home. Solatube's Raybender 3000 technology protects your family and your furniture from the suns harmful rays. This redirects low-angle sunlight in the winter months, while rejecting overpowering mid-day summer sunlight. A LightTracker Reflector also aids in increasing light input for a greater light output. The lens fixtures are easy to twist off making for a quick and easy clean. However, you should not need to do so often. Big or small we’ve got you covered! Solatubes come in a 14-inch tube and a 10-inch tube so that you can choose the best fit for you. You read that right. Because these tubes have that solar nightlight included, they are eligible for a total tax credit of 55%! 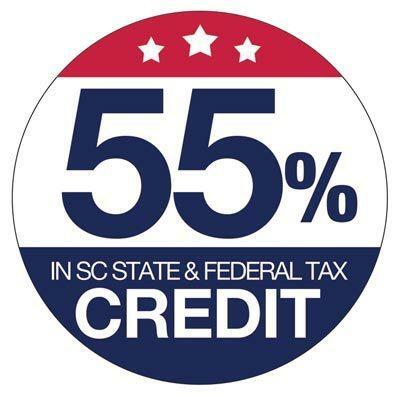 There is a 35% federal tax credit and a 25% South Carolina State tax credit for solar products. So not only are you saving on your electric bill, you’re making money at the same time! These Solatubes have about a two-hour installation time. So, in the time it takes you to finish those last two episodes of Game of Thrones, you could have a Solatube installed! 14. You have a Solatube provider in your area! Carolina Energy Conservation is YOUR local Solatube provider. We do offer FREE home energy evaluations, where we come into your home and give you an idea of some ways to save on your monthly electric bill, and while we’re there we’ll get you fitted for your Solatube! Give us a call today to set up your FREE Solatube consultation. Keep an eye out for Solatube specials coming soon in a ValPak near you!